Suggested by Destroyer Godzilla Junior has never been thought to be all that powerful but it’s because he is stuck in a universe where all of the monsters are crazy powerful. Stick him in a universe that is a little less intimidating and then you’ll see things begin to change. 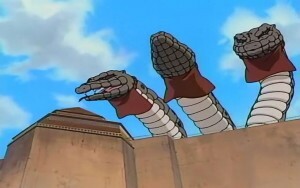 The Three Giant Snakes are huge but that all they’ve got going for them. Junior would have no trouble at all blasting them to smithereens. Godzilla Junior wins. This entry was posted in Battles, Godzilla Junior Battles, Three Giant Snakes Battles and tagged Godzilla Junior, Three Giant Snakes by dreager1. Bookmark the permalink.